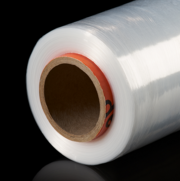 POLIFILM manual stretch films are used for securing commissioned merchandise in the distribution and logistics industries as well as in trade. They are used for securing both fresh products such as vegetables and flowers or in-house transport. POLIFILM produces manual stretch films with a broad selection of widths, thicknesses and levels of quality. In addition to the conventional still pliable hand rolls, the range also comprises pre-stretched manual stretch films. For improved visibility shielding and theft prevention, all types of POLIFILM manual stretch film can be obtained in the standard colours black and white. It is also possible to dye film with other colours according to the colour reference catalogue. Depending on the application, POLIFILM equips the manual stretch films with one smooth side. Especially advantageous features of our newly developed manual stretch films with reduced thickness are high retention force and outstanding mechanics. Manual stretch films in accordance with standards for food are also available from POLIFILM. More than 10 per­cent of all hand films are dis­card­ed due to dam­age. We’ve put a stop to that! POLIFLEXX has rein­forced edges and is wrapped softly to pro­vide per­fect pro­tec­tion even if han­dled with less care.